← Can’t get healthier than this – whole wheat seed cracker! Liquid jaggery in my carrot cake! Of late I’ve been hearing a lot about “healthy food”. More since last month. Nature’s Basket opening up a new section “Healthy Alternatives” and Phoneix market city organizing a” World health day”. It makes me wonder why now! Why only now are we thinking of eating healthy? A very interesting point that Dr.Anjali Mukerjee, a nutritionist discussed was that there is so much information that a consumer is exposed to that it is difficult to decipher what is really good for you. End result the consumer is confused. Let us for example take sugars or sweeteners in our diet. Some say unpolished/unsulphured sugar or commonly known as raw sugar, is better than polished ones or jaggery is even better or for that matter blackstrap molasses is the best or what about coconut sugar? Have I confused you? All the above sugars are good for you. Yes. I tend to ratio my usage of these different sugars depending on the usage. Jaggery does have an overpowering quality and actually can change the taste of your recipe. For example, lets take liquid jaggery in baking. I found liquid jaggery a bit sweeter than cane sugar and jaggery. Jaggery is also high on medicinal and nutritional values. So what is liquid jaggery? Sugarcane is boiled for hours to achieve a thick consistency of liquid -like. This is liquid jaggery. The further boiling of this mixture results in jaggery. Jaggery is a good source of iron that helps in improving haemoglobin levels and prevents anaemia. Jaggery should be consumed with extra precaution if you are a diabetic. Don’t confuse liquid jaggery to molasses. They are different in terms of taste and nutrients. 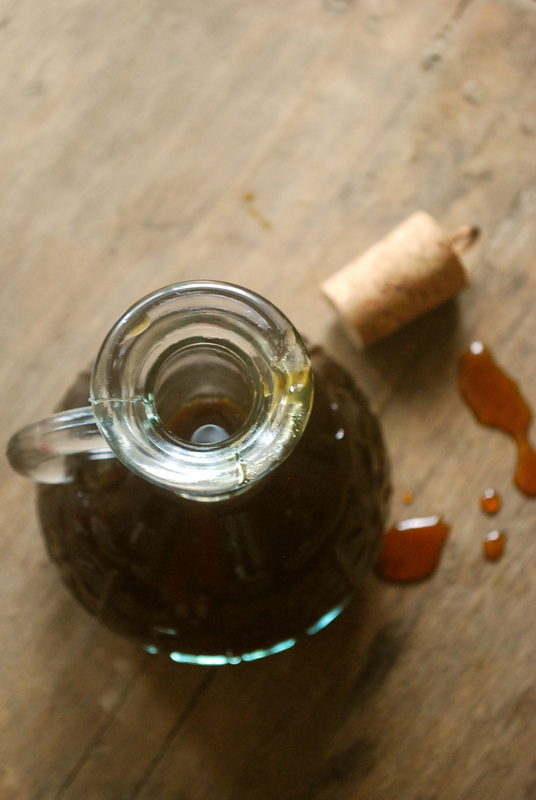 So now that we know what liquid jaggery is..how about some baking with it?! Liquid jaggery is a new ingredient to me and I was a bit nervous to use it in baking. I tried asking on twitter and couldn’t find any recipe. I took it up as a challenge and thought of using it in my carrot cake. I had my first bite and I knew, I had created the recipe that was not only healthy but flavorful. My cake was dense but the cream cheese frosting made it the best wheat based cake I’ve ever had! 1. Preheat the oven at 160 degree centigrade and grease a round mini cake pan (I used 18cm dia pan). 2. Sieve the flours along with baking powder and cinnamon powder. 3. Add liquid jaggery, butter and beat until mixed well. 4. Add egg and beat lightly until fluffy. Add grated carrot and mix well. 4. Combine the dry and wet ingredients gently and mix it with the help of a spatula. 5. Pour the mixture into the greased pan and bake for about 20-25 minutes or until its done based on your oven settings. 6. Allow it to cool on a wire rack for about one hour. 7. Prepare the frosting by mixing all the ingredients until combined. 8. 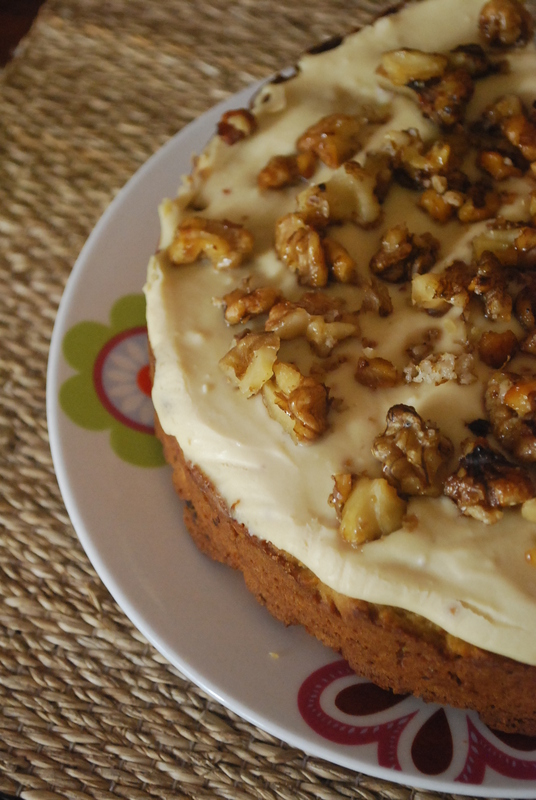 Top the frosting on the cake and garnish with some caramelized walnuts for a crunch. If you don’t like wheat flour in your cake, go ahead and use any other type of unrefined flour. This recipe makes a single layer cake for four. You can also double the recipe and make a two tier cake with cream cheese frosting in between. You can replace powdered jaggery with liquid jaggery. This cake tends to be a little dry in texture. 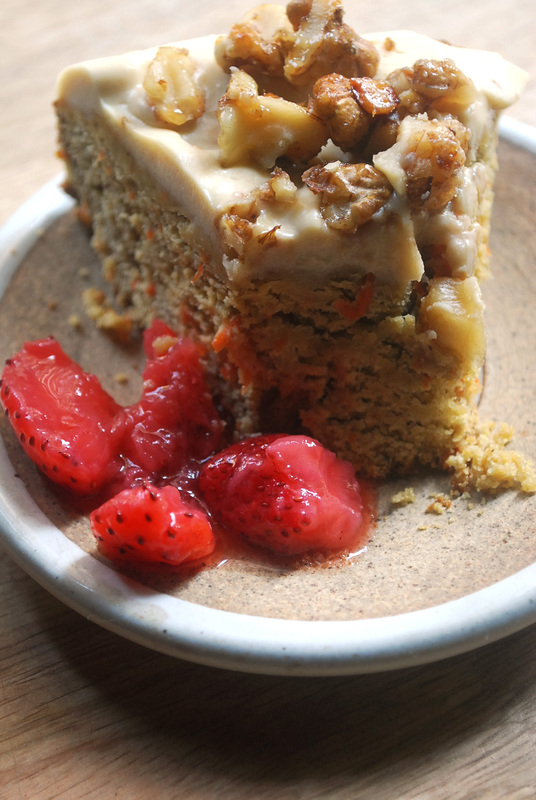 So if you don’t want to use cream cheese frosting, you can also top your cake with fruits, jam or cream. I actually use jaggery a lot in my baking and try and substitute sugar with it whenever i can… have never tried liquid jaggery though! Is it easily available? The cake looks good and the cream cheese frosting amazing!!! Do try the recipe and I look forward to your feedback. awesome! Made it, loved it! the two changes I made – made the cream cheese using cottage cheese, and made the jaggery syrup at home… turned out wow! will be posting images on my FB page http://www.facebook.com/esvasaindia... thanks Megha!